Find hotel near Kelly Tarlton's Sea Life ..
Head over to Kelly Tarlton’s Sea Life Aquarium and discover a diverse collection of aquatic life. 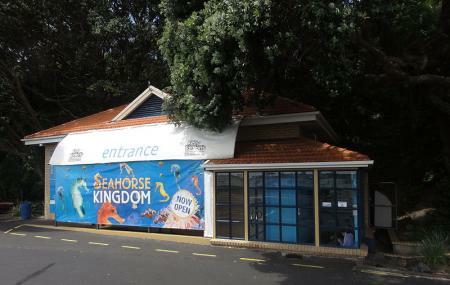 It was opened in the year 1985 by visionary Kelly Tarlton (a Kiwi adventurer, diver, explorer and inventor). From Shark Dives and Shark cages experiences to a Penguin Discovery to a behind the scenes tour, head over to the Kelly Tarlton’s Sea Life Aquarium along with your family and kids and have a wonderful time. If you book online, you stand a chance to get a discount anywhere between 10 % to 25%. Snack shacks present within the aquarium premises. How popular is Kelly Tarlton's Sea Life Aquarium? People normally club together Auckland Art Gallery and One Tree Hill while planning their visit to Kelly Tarlton's Sea Life Aquarium. Very good aquarium and great for both young and older kids. Lots of interactive displays and the play area is great. Full of teaching opportunities for teachers and parents and self-learning for kids. The fishes and all the other animals are lively, interesting and seem to be very healthy. Unfortunately, I don't have photos of the sharks, turtles and stingrays but they are just as beautiful and majestic. I'll say that this is a pretty chill date spot as well 😉. The fish, turtle, and penguin displays we're impressive and so clean! The penguins were in an refrigerated area covered with snow, with water to swim in. Viewing glass above and below the waterline allowed you to see all the activity. You can really get close to the penguins and there are a lot of them. There was a great display of the Antarctic huts used by Scott and other explorers which made you feel like you were huddled with them waiting out a horrific snowstorm. Awesome. Kelly Tarlton's has harbored many of my fondest childhood memories. I remember my first time standing in awe watching the penguins and the thousands upon thousands of fish flying across the ceiling. I used to loop around the tunnel countless times, and visiting today I still would. It is an amazing place that shows everyone the true beauty of the sea. The sharks were very purposeful and busy, had hoped for some very interesting views up and under them, but it didnt work out that way! hey it's still great. I loved it, the penguins and all the lovely exhibits. Thinking about getting a pass for there so i can go more often. Always enjoy coming to Kelly Tarlton's. It's quite pricey, but we managed to get discounted tickets. There is so much to see and to explore, and they do a lot to help protect our oceans and sealife. A must do in Auckland! The underwater tunnel is amazing!! !